For about a week and a half, the tragic story of Trayvon Martin‘s killing at the hands of self-styled neighborhood watchman George Zimmerman (who claims self defense) galvanized much of the nation in support of justice for the slain teenager and his killer. Then, President Obama made the dastardly choice to offer words of comfort to Trayvon’s family and millions of supporters, and suddenly, the right wing decided that the media was aiding Trayvon Martin in oppressing his killer from beyond the grave. Luckily, all the latest right-wing guano has been aggregated in a one-stop shop by Human Events‘ John Hayward, so let’s clean the shelves. Hayward’s premise is that the media has conspired to make Trayvon Martin seem as sympathetic as possible, while doing their best to screw George Zimmerman. Let’s take this point-by-point. Hayward and his idiotic “sources” (blogger Dan Riehl, in this case) posit that the grainy image on the left is the original photo of Trayvon in a hoodie, while the clearer version on the right has been “Photoshopped” to make him look lighter-skinned, and in their minds, more innocent. The problem is, that “original photo” is from a Miami Herald article that pretty clearly identifies it as a picture of a picture on a sign at a Trayvon rally. Next, they’ll be asking why the Gutenberg Bible has been altered to look older than the “original” they found in a motel nightstand. I’ll leave it to the reader to decide if Riehl and Hayward are really that stupid, or are just racist liars. Meanwhile, Hayward accuses the media of contrasting the de-blackified Trayvon pictures with a sullen mugshot of George Zimmerman, when the could have been using the much nicer-looking photo of a smiling Zimmerman in a business suit. 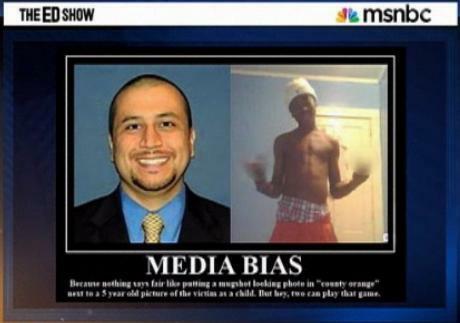 In this case, he’s just a liar, since he links to an article that says the smiling Zimmerman pic was just released over the weekend, and is being widely used by the media now. Next, Hayward dings the media for referring to George Zimmerman as “white” in news accounts as recently as March 19, because this case is clearly about the tragic marginalization of white people. What he fails to mention, either because he’s lazy or lying, is that George Zimmerman was identified as a “white male” by the Sanford Police Department, not by the media. As a white Latina, the number of times I have seen some people claim that my identity is a politically expedient radical leftist fabrication this week is quite troubling. I’m pretty sure I exist—the U.S. Census has explicit denominations for race as a separate category from whether one is Latino or not, for starters. As I suspect the sort of people that don’t believe in white Hispanics may also not trust the tyrannical U.S. Census, it’s worth fleshing out the reason why this is so. “White” is a racial designation, related to genetics. “Latin American” (or “Hispanic” as some prefer) is an ethnic designation, related to geography and culture. So people who grew up in Latin American countries or within one of many Latino cultures can come from any genetic background: black, Asian (you haven’t lived until you’ve tried Cuban fried rice! ), and yes, even white. For the unconvinced, I have seen Frances Martel in real life, and she really does exist. He doesn’t offer an alternative designation for the development, so I guess the media were supposed to make one up. Hayward concludes by arguing that there is not a “wave of angry white people shooting black youths,” which is a relief, because the central issue in this case isn’t that there is, but that in places like Sanford, such a pastime entails less hardship than parking in a tow-away zone. What’s stunning is that Hayward makes this case by citing FBI statistics that use the same “white Hispanic” designation that he just said we made up. Update: Apologies for misspelling Trayvon Martin’s name in several places, and thanks to those who pointed it out. I have corrected the errors.